The NCAA men's basketball tournament was first hosted in 1939, and has been played a total of 81 times through 2019. That's a lot of history. Here's what March Madness looked like the year you were born. 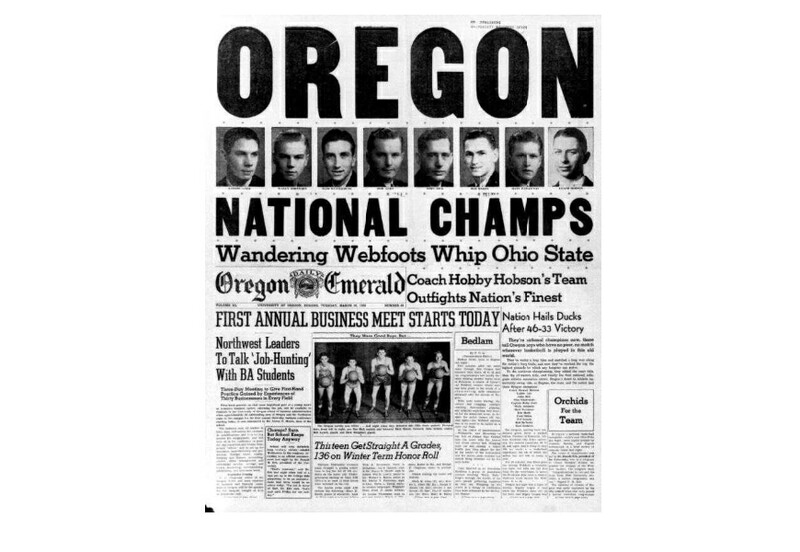 Oregon defeated Ohio State, 46-33. Marv Huffman (34) was named most outstanding player for 1940. The Hoosiers defeated Kansas, 60-42, for the NCAA title in Kansas City, Missouri. Charles Epperson (38) goes to the basket in the Badgers' 39-34 victory over Washington State. Kenny Sailors grabs a loose ball during a game against St. John's, the NIT, champs in a war time Red Cross fund raiser which packed Madison Square Garden. Utah beat Dartmouth 42-40 in overtime to claim the program's first (and only) title. Oklahoma State's Henry Iba gives a chalk talk to his 1946 NCAA Champions. George Kaftan of Holy Cross is carried off the court after defeating Oklahoma, 58-47, for the title. Fans celebrate UK's championship with a street parade. Kentucky defeated Baylor 58-42. Kentucky defeated Oklahoma, 46-36, in 1949. The program from the finals, where CCNY beat Bradley, 71-68. 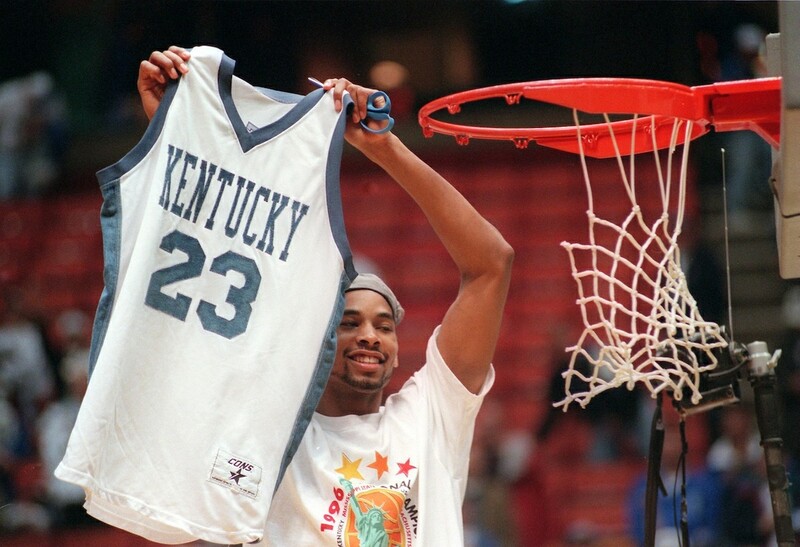 Kentucky’s 7-foot center Bill Spivey scored 22 points in the title game. Kansas head coach Phog Allen gives MVP Clyde Lovellette a hand shake for a job well done in the 1952 Championship game at Seattle,WA. Kansas beat St. John's for the title 80-63. Indiana coach Branch McCracken argues with the scorer over the amount of fouls on Kansas center B.H. Born during the title game held in Kansas City, MO. at the Municipal Auditorium. Indiana defeated Kansas 69-68 to win the title. Bill Russell gets a ride off the court after San Francisco won the 1955 title game. Bill Russell led the Dons to consecutive NCAA championships. Undefeated North Carolina held off Wilt Chamberlain and Kansas in triple overtime. The photo corps at the 1958 title game in Louisville at Freedom Hall. California coach Pete Newell rides on the shoulders of this team after defeating West Virginia 71-70. Celebration after a Buckeyes victory. The Bearcats' pennant after their first of two consecutive national championships. George Ireland directs Loyola (Ill.)'s only national championship team. UCLA coach John Wooden and his championship team after winning their first NCAA basketball title. UCLA's Gail Goodrich (center) and teammates run on to the court after the victory. David Lattin (42) and a Texas Western teammate compete for control of a rebound during the 1966 NCAA Championship. A UCLA team member tears down the net following UCLA defeating Dayton 79-64 for the national title. Kareem Abdul-Jabbar skies during the 1968 Final Four. Kareem Abdul-Jabbar and his father. UCLA defeated Artis Gilmore and Jacksonville, 80-69. UCLA forward Curtis Rowe (left) coach John Wooden and forward Sidney Wicks at the Astrodome. UCLA center Bill Walton during the title game held in Los Angeles at the Sports Arena. Fans cheer during UCLA’s 87-66 victory over Memphis State. North Carolina State's David Thompson scores the final points in a 80-77 double OT semifinal victory over UCLA at the Greensboro Coliseum. UCLA returned to the top after a year off. The Hoosiers finished a perfect season over Michigan in the national championship game. 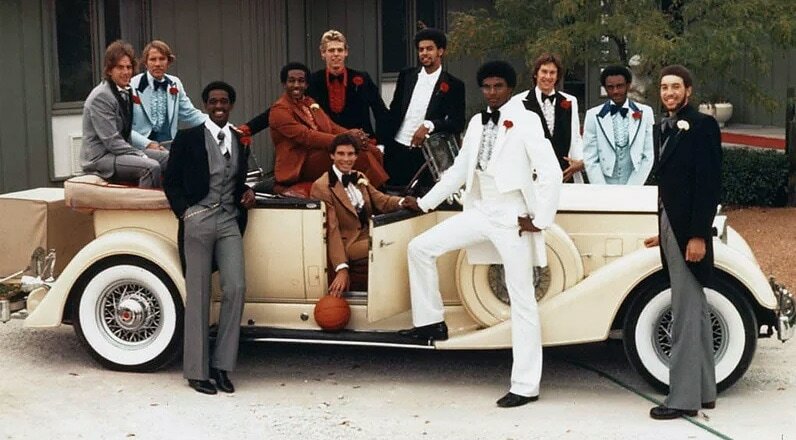 Quite a look from Al McGuire and the 1977 Marquette national champs. SI wrote on the story behind the photo. Two of the Wildats' 94 points over Duke in the national championship game. 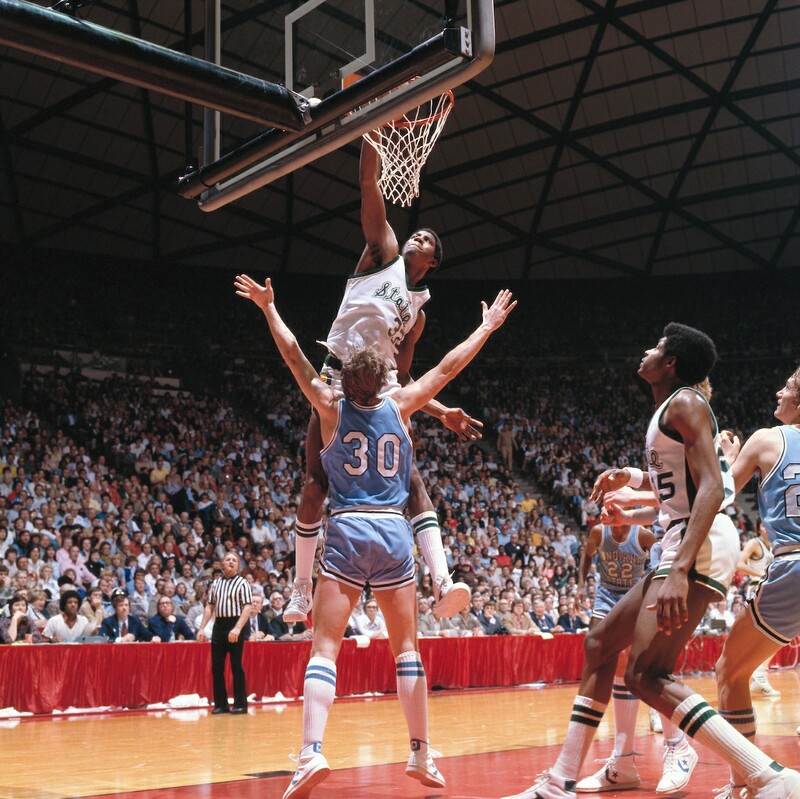 Young Earvin "Magic" Johnson throws it down en route to a Sparty championship. 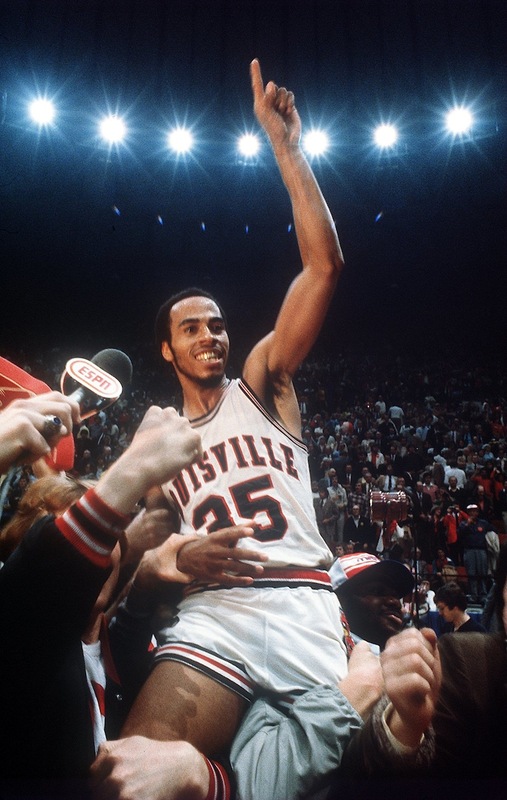 Darrell Griffith, AKA Dr. Dunkenstein, rides the wave of Louisville's national title victory. Bob Knight's Hoosiers celebrate after topping UNC in the national title game. 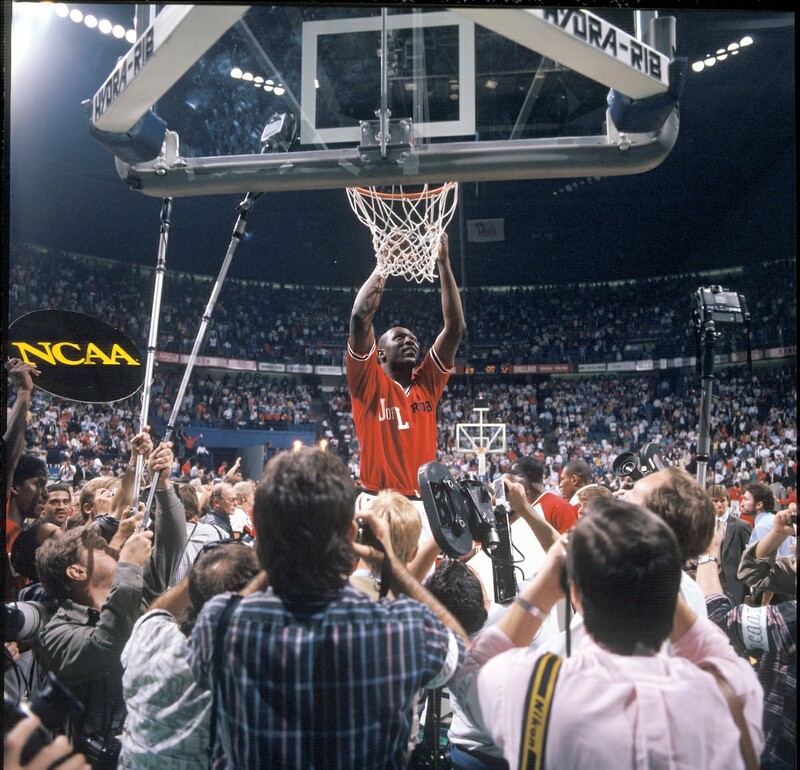 North Carolina won the national championship in 1992 with Michael Jordan (23) in tow. The Jim Valvano-led Wolfpack claimed the 1983 national championship. Patrick Ewing and John Thompson. Rollie Massimino cuts the nets after Villanova, the only 8-seed ever to win in a 64-team tournament, shocked Georgetown. Louisville became the first team from outside a power conference to win the championship since the expansion to 64 teams. Rony Seikaly goes for a block in a game Indiana would go on to win. Danny Manning sends it in on the way to a KU national championship. A birds' eye view of the 1989 Final Four, which belonged to the Wolverines. Jerry Tarkanian's Runnin' Rebels sport Just Did It hats after the 1990 national championship win. Bobby Hurley of Duke was named the 1992 tournament's Most Outstanding Player. 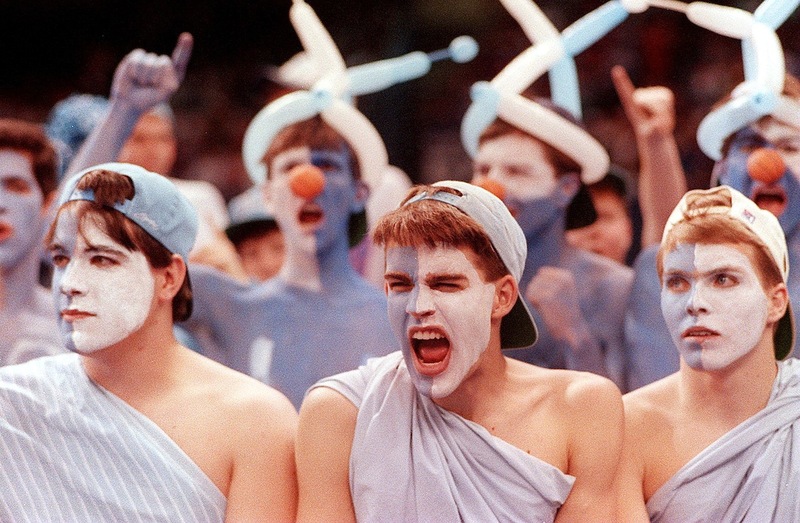 UNC fans in full Final Four mode at the 1993 national championship game. The Razorbacks celebrate their most recent national championship. UCLA team members join together prior to the Division I Men's Basketball Championship held in Seattle, WA. 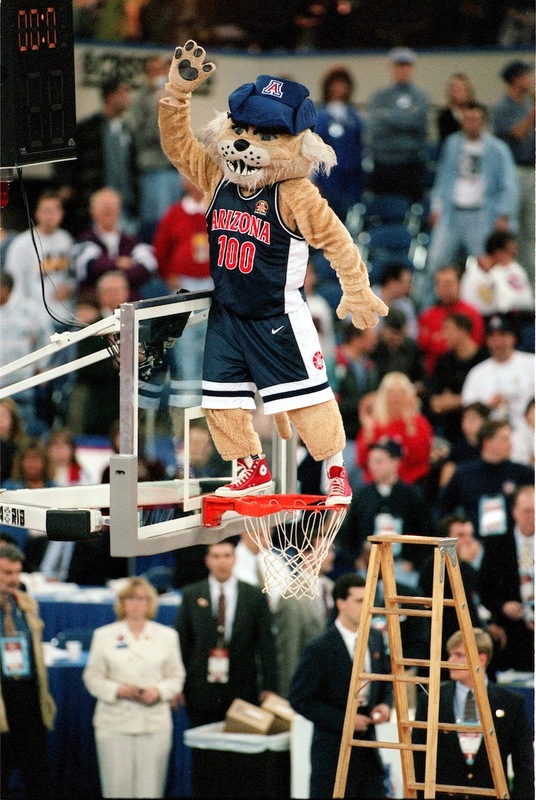 Arizona Wildcats, national champions -- even the mascot. Kentucky topped Utah in the Utes' first Final Four appearance since 1966. Elation after UConn won the 1999 national championship. An excellent moment after Michigan State's national championship victory. Shane Battier drains a shot with touch en route to a Duke national championship. 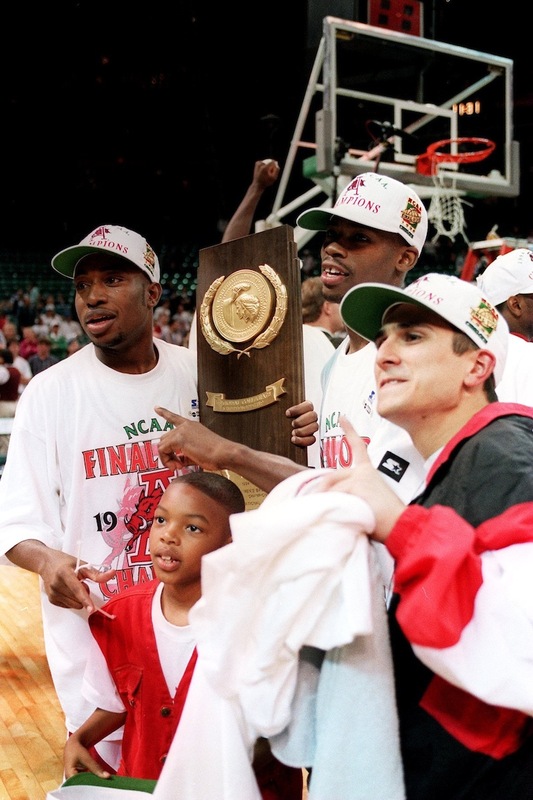 Maryland's 2002 national championship win was just peachy. Carmelo Anthony's season at Syracuse left an unforgettable mark. The Huskies topped Jarrett Jack's Georgia Tech team, the Jackets' last appearance in the national championship. Sean May's Tar Heels claimed the national title in 2005. The Gators made it two straight. Mario Chalmers knew Kansas had sealed the deal in overtime. 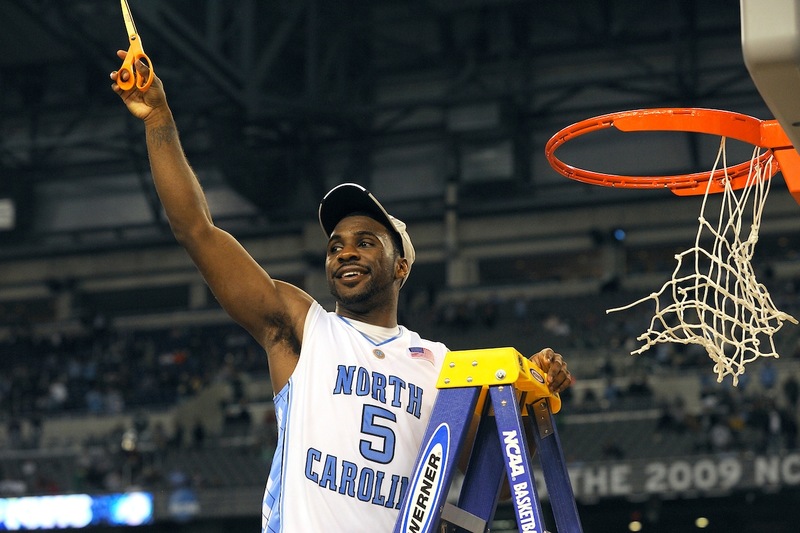 Ty Lawson waves to fans after cutting down the net following the championship game. Duke won, but Butler's Gordon Hayward nearly made the greatest shot in tournament history. The maelstrom after the Huskies' improbable run ended in glory. Anthony Davis goes for a national championship-worthy block. Air time in Louisville's Final Four win over Wichita State en route to a championship. Shabazz Napier and the Huskies won the 2014 National Championship. Duke players pile up after winning the 2015 NCAA Men's Division I Championship game. Villanova players celebrate after Kris Jenkins hit a buzzer-beating 3-pointer to win the national championship. UNC senior Kennedy Meeks blocks Gonzaga’s Nigel Williams-Goss’ shot, and secures redemption for North Carolina. Villanova's Donnie DiVincenzo (10) scored 31 points off the bench to win MOP, and help the Wildcats secure the title for the second time in three years. Michigan State earned a bid to the 2019 NCAA tournament with a win in its conference tournament championship game.